HELLENISTIC, CIRCA 4TH CENTURY B.C. 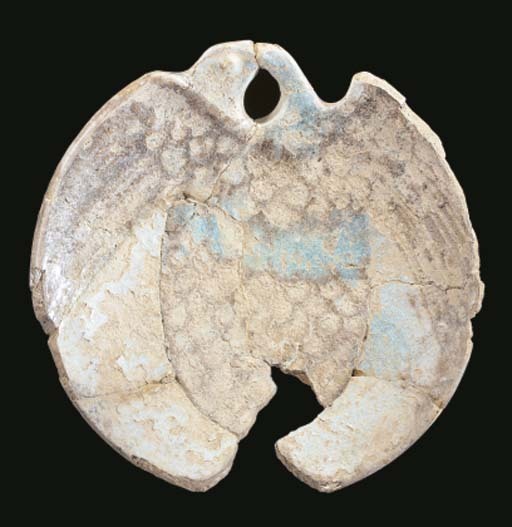 The shallow pale blue glazed dish with large bird with outstretched wings, its head cut away at the top of the bowl with its curved beak bent over as if preening, the body and feathers indicated in dark brown glaze with central turquoise cross band, repaired; and a small hemispherical faience bowl, with short trough spout and pierced lug on rim opposite, remains of green glaze, repaired, Late Bronze Age, late 13th Century B.C. The Art of Ancient Cyprus, p. 227, pl. 259 (item one). Item one: there appear to be no parallels for this dish. The curving back of the beak forms an aperture by which the dish could be hung on a wall peg. PROPERTY FROM THE COLLECTION OF DESMOND MORRIS: LOTS 1-134, 343-345, 371 AND 389-390.